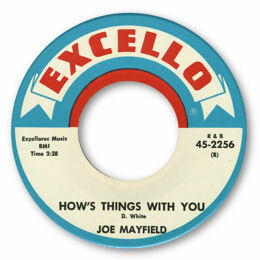 The terminally obscure Joe Mayfield cut this rare hunk of deep soul magic in 1964 and what a triumph it is. Check out his cracked vocal and obvious pain as he meets an old flame. The bluesy guitar, electric piano and subdued horns add to the mood of How's Things With You beautifully. Joe’s other 45 for La Salle/Rocket is straight blues. Note ~ "How's things with you" can be found on the Ace UK CD "Louisiana Roots The Jay Miller Story". Thanks to Pete Nickols for extra CD info.